On February 24 at 10:00 a.m. CST, Design Data will host a free, live webinar on Introduction to BIM Joists in SDS/2. 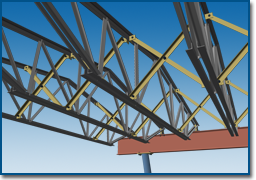 With the addition of SDS/2 BIM joists, users can now import a variety of joists, from K series and joist girders to double pitch and bowstring. In addition to the existing SDS/2 joist used to generate connections, users can also import a file that contains the final materials of each "as fabricated" joist, including top and bottom chords, seats, web panel point locations, etc. The two work together to satisfy joist connections and BIM project requirements. This webinar will cover the use of SDS/2 joists and how connections are created with them, and how to import the as fabricated joists using an XML file provided by the joist manufacturer. It will also demonstrate a common joist workflow, from inputting SDS/2 joists to importing as fabricated joists for clash detection and placement resolution.